When a tree is in need of being felled it will become imperative to know how to properly cut down a tree. Your landscape can be improved and made to look even better than before. No matter the situation, whether the tree is diseased or it is dying from any sort of infestation of bugs, immediately cutting it down can be a hazard. Location is important in terms of cutting any tree down. A tree that is in close proximity to an inhabited building or open road needs be removed in the right way. Here is how to cut a tree. Read on for more information. When starting to cut a tree you will need to use a ladder. I suggest an orchard style ladder. This ladder has a supportive leg and is narrow in stature. It is very easy to use inside of spaces like tree branches. Tie some rope to the supporting leg and the rungs of the ladder. Begin at the top of the tree. You will need a chain saw or a prune saw to help with this step. Take off the branches in measured, easy to handle lengths. Do not remove pieces that you cannot hold, lift or handle. Rotate the ladder around the tree while you cut down. Do not try and trim branches that are out of physical reach. They may fall when cut and cause danger. To remedy this, just move the ladder as needed. 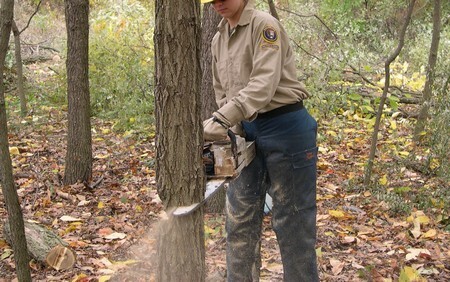 Adjust the ladder so that the trunk of the tree can be cut down safely in sections. Cut the sections into manageable sizes. This is going to make discarding the tree trunk a lot easier. Remove the tree apart and down until approximately 6″ of the ground. Get a stump remover. These can be rented. Saw down the rest of the tree trunk. The machine will lighten the load tremendously. Be careful with this machine because the debris resulting from it can be launched up to 30 feet. Point the end in the opposite direction of your house or any street or thoroughfare prior to beginning to work. Once the branches and trunk have been removed and cut into pieces. Allow the pieces to dry. Burn these pieces as firewood after they have dried.